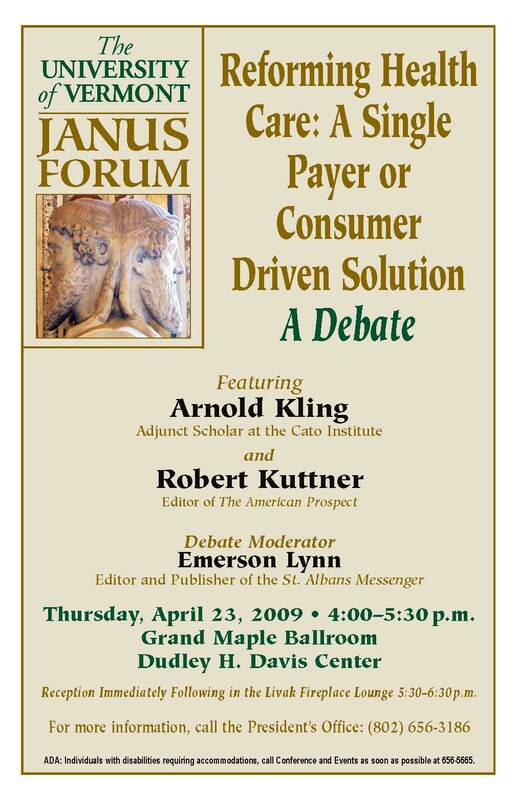 On April 23, 2009, the Janus Forum presented a robust debate about how to effectively reform the American health care system. This debate featured Arnold Kling, David Corn, and Emerson Lynn. Arnold Kling is an economist and scholar at the Cato Institute known for his book, Crisis of Abundance: Rethinking How We Pay for Health Care. David Corn is a political journalist and Washington Bureau Chief of Mother Jones. He has published a number of articles on the U.S. health care system and regularly appears on talk shows as an expert on the subject.